Erected by McKay Sinclair Gunn coachman Wick in memory of his father. Alexander Gunn farmer of Mid Clyth died April 1882 aged 84. Wife Isabella Henderson died April 1883 aged 88. Son McKay Sinclair Gunn died at Kirks Lane Wick 20th September 1907 aged 70. 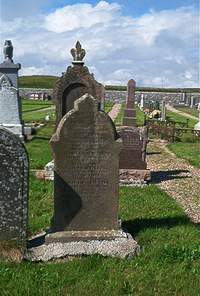 Wife Janet Macleod died 30th October 1905 aged 81.